Regiment/Catrawd: Royal Welsh Fusiliers, 9th Battalion. Military Cemetery/Memorial / Fynwent milwrol: La Laiterie Military cemetery, France. Killed in action 12 August 1916, age 32. Joseph Leonard Hughes was the son of Thomas and Mary Ann Hughes, and the husband of Elizabeth Emma Hughes, nee Pierce. Ancestry records show that he was born in the second quarter of 1884, and registered at Holywell. He was known by his second name, Leonard, as his signature is either written as J. Leonard Hughes, or Leonard Hughes. We first come across his family in the 1891 census for Wales, available on Ancestry. The family was living at 90, Vale Street, Denbigh. Head of the family was Thomas Hughes, 36, an insurance agent who had been born at Halkyn. His wife Margaret was 41, and had been born at Holywell. The children were John E. age 10, Jane P. age 8, Joseph L. age 7, and Mary who was 4. All the family spoke both Welsh and English. Leonard attended the Denbigh County Grammar School, as we read in the North Wales Times for August 13th 1898, that J. Leonard Hughes gets an award for second class in Mathematics, and on July 31st 1897, a proficiency certificate in shorthand. In 1901 the family is at Gobeithfa, Henllan, Denbigh. Thomas Hughes, now 46, is superintendent in an insurance company, born at Northop. Mary Ann is 51, her birthplace is given as Berth Ddu, an area of Rhosesmor. Jane Powell is 18, and a dressmaker. Joseph Leonard, 17, is a solicitor’s clerk, Mary Hevin, 14, is a servant and domestic. Thomas Powell, age 9, has been born since the last census and is at school. In the 1911 Census for Wales, we find Joseph Leonard Hughes, age 27, a solicitor’s articled clerk, alone at Frongoch School House, Denbigh. In the same census, his future wife, Emma Elizabeth Pierce, age 28, and who is described as a head teacher with the County Council, is living at Swiss Cottage, 90 Vale Street, Denbigh. There are regular mentions in the North Wales reports of Court Proceedings which name J. Leonard Hughes, some linking his name with Mr A. Foulkes-Roberts, of Swan Chambers, Denbigh. The couple were married on 21st February 1914, at the Pendref Wesleyan Chapel Holywell. It was a very grand and impressive affair. The Denbighshire Free Press newspaper, Y Cymro, devotes an entire column on the front page to a description of the wedding and a long list of their wedding gifts. After the wedding, Mr J. Leonard Hughes, solicitor, and his new wife, travelled by motor car to their new home, Hopefield, Prestatyn. Their only child, Geoffrey Pierce Hughes, was born on 15th August, 1915. The website Soldiers who Died in the Great War confirms the details listed above. There is no card for him in the archives at Hawarden, but his Military Service records have survived. From Leonard’s records we know that he enlisted at Prestatyn on 12th November 1915 and took the oath on the same day. He attested at Kinmel Camp on 3rd April 1916, and signed up for the duration of the war. His age at enlistment was 31 years and 7 months. The medical examination was at Rhyl, and details state that his weight was 9 stone 12 pounds, his physical development was fair, and it was noted that he had defective teeth. His height was 5 feet 11 inches, and his chest measurement was 35 inches, 37 inches when expanded. His occupation was a solicitor, and his religion was Wesleyan Methodist. His own address was Hopefield, Plas Tirion Avenue, Prestatyn. However, in the information given by the recruit, the address of his next of kin, Elizabeth Emma Hughes, was given as Cheshire View, Brynford Holywell, c/o Mr D. Pierce. This was the home of her father, Mr Daniel Pierce, a retired headmaster. As Elizabeth had only recently given birth, this was probably the reason for this. The records further tell us that after enlistment on 12th November 1915, he was transferred to the Army Reserve, then mobilised on 8th March 1916, and posted on 9th March. A casualty form gives details that he embarked at Southampton on 11th July 1916, and disembarked at Le Havre the next day. 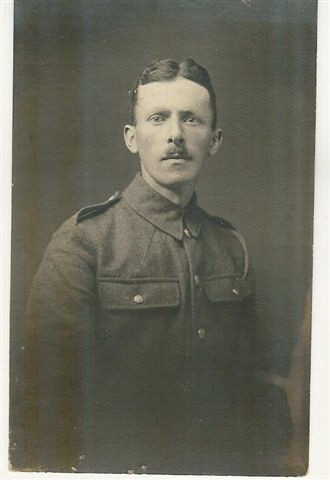 He was posted to the 19th battalion, Royal Welsh Fusiliers on 11th July, then he was re-posted and proceeded to the 9th battalion RWF on 21st July. On 25th July he joined the 9th RWF in the field. On 12th August he was killed in action in the field. The Prestatyn Weekly for July 15th informs its readers that Private J. Leonard Hughes, solicitor, departed for France on Tuesday. This has been a disastrous week for the homes of several boys connected to Prestatyn. J. Leonard Hughes, solicitor, of the office of Mr A. Foulkes-Roberts, and highly respected by all, has been killed by a bomb from a trench mortar. He had been in France only a short time. He leaves a wife and infant. The article then names several other soldiers who have been wounded, some seriously, in the previous week. Soon after Leonard’s death, there is correspondence recorded in his Service Records regarding some confusion as to his rank at the time of his death. Had he been commissioned as an officer, his pension would have been larger than that of a private soldier, and Elizabeth seems to have been under the impression that he had been promoted. A letter was written on her behalf by a railway manager in Birmingham to the Regimental Paymaster in Shrewsbury, stating she believed he had been promoted to 2nd Lieutenant, and referring to an entry in the London Gazette. Meanwhile she was regarded as the widow of a private soldier. In his reply, the Paymaster stated that he had no knowledge of a commission being awarded, but meanwhile would Mrs Hughes forward relevant documents including her marriage certificate, and he would forward the letter to the War Office for a decision. The War Office replied to the Paymaster that an application for an appointment to a temporary commission in the Regular Army had been received in the department, and was under consideration at the time of his death. Sir, in reply to your letter dated 14th August 1919, I am directed to inform you that 20860 Private Joseph Leonard Hughes was not appointed to a commission. An application on his behalf for appointment to a temporary commission in the Regular Army had been received in the department, and was under consideration at the time of his death. A Gazette notice of the appointment to a temporary commission of John Llewellyn Hughes has perhaps been thought to refer to the late Private Joseph Leonard Hughes. Mrs E. E. Hughes signed for the receipt of these items on November 13th, 1920. On the Army form 5080, asking for all living relatives of the deceased soldier, are the names of Mrs Hughes and her son Geoffrey. Leonard’s father was dead, but his mother but his mother, Mrs Mary Ann Hughes, his brother Thomas P. Hughes, and sister Mary Hevin Hughes, were living at 1, Pigot Villas, Denbigh. Another sister, Jane Powell Davies nee Hughes, was living at Wrexham. In the website for Soldier’s Effects, Mrs E.E. Hughes is named as widow and executrix. She received a grant of £2 13s 3d on 19th August 1918, an adjustment of £3 00 on 17th October 1918, and a War gratuity of £19 2s 0d on 22nd September 1919. In the website National Probate Calendar for England and Wales, we are informed that probate for Joseph Leonard’s will was granted on 8th February 1918 at St Asaph. The amount left to Elizabeth was £739 11s 6d. Ancestry records show that their only child, Geoffrey Pierce Hughes, died in 1933, aged 18, his death was registered at Holywell. The death of Elizabeth Emma Hughes was registered at Holywell in 1971, aged 89. J. Leonard Hughes is also commemorated on the Roll of Honour at Rhyl cemetery.